How much are those first editions REALLY worth?? Or, how I decluttered some of my bookcases (because it’s DEFINITELY not been minimalised yet). I wanted to leave this until last because it’s going to be the hardest part of the whole minimalism thing, but I have briefly forayed into it today. We have both brought books into this relationship (I came with two entire boxes – and now I have an actual bookcase of books, although it’s also filled with comics and so many sideways stacks wherever there is space. My husband had over 2000 books when I met him and has also acquired more over the course of our relationship). The mere mention of getting rid of the books is enough to put strain on our relationship. But over the last five years I have realised that most of these books don’t get read, and we will probably never read them. A couple of years ago, we were living in a Gothic Mansion in Bradford. We moved into it from a 2-up-2-down (a Victorian terrace with 2 small downstairs rooms and 2 small upstairs rooms – when I parked my small hatchback out front, the car was longer than the house was wide), and moved out of the Mansion into our current, significantly smaller 3 bedroom house, so, I think the only name for the place in Bradford was Gothic Mansion. It had a sweeping staircase and everything, and cost the same in rent as the 2-up-2-down in York had done. 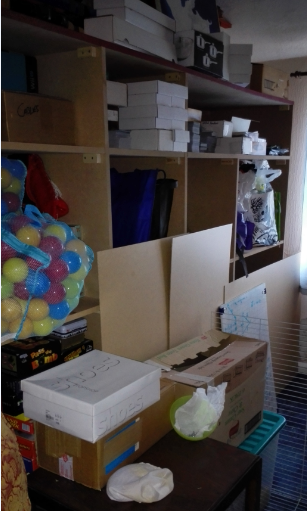 When we moved out of the Gothic Mansion, we realised just how many belongings we had accumulated over the previous 2 years of living in so much space. When it came time to pack the books, we got rid of about 100 of them – my future husband gave his to other people and I gave mine to charity shops. It was a drop in the ocean. Somehow, when we unpacked at our new house, we still had far too many books. It was shocking. I got my Significant Other to put ceiling shelves up around the top of the two largest bedrooms (we sleep in the smallest because it helps my night terrors significantly), and we filled them with books. We had two full bookcases of books left over, and that was after I got rid of an entire box of books. We gave our other bookcases away to someone who was setting up home and to a community furniture initiative. The house is so cluttered that you can’t actually see the ceiling bookshelves behind all these boxes on top of the storage unit. I was just about coping with the book situation because we had worked so hard designing and making the ceiling shelves (they look like a book border around each room, it’s awesome). Then my mum died, and I brought another box of books back, which were books I’d grown up with. I actually brought two boxes back but decided to let the second one go before it crossed the threshold of my house – it was all my Award Reprint Famous Five books, which I’ve by and large replaced with a beautiful collection of First Edition Famous Five books. I decided the Awards would be better served living with someone else where they would actually get read. Suddenly, though, we are drowning under items, books especially, and I have to make some very hard decisions about books. The thing is, and the big reason that I haven’t addressed it, is because I feel it’s very unfair for me to have to get rid of some of my one bookcase of books when my OH has about five times that many books. Inherently, I am biased towards thinking that my books are better, because I chose quality over quantity. I’ve fallen into the trap of that excuse my pupils come out with sometimes: “Ben is setting his EYEBROWS on fire, why am I getting a detention for SMOKING? ?” Obviously, just because someone nearby is doing something worse than me, that doesn’t make my behaviour okay. Another problem is that I am keeping more than half of my books for children. If I have any, or if any close friends do, I’m going to be ready to give them books to read. Unfortunately, that time hasn’t come yet. The third problem is that I have a lot of first editions – I very carefully collected them all, and they’re all great books. Because it all seems so complicated, I am trying to be very deliberate and careful in my decisions. 1. Fill a box with the books I’m keeping for kids. 2. Fill a box with the books I’m keeping for myself. 3. Fill a box with all the duplicates we’ve got that belong to me (then hash it out with my OH about whose copy of each duplicate we are keeping/getting rid of. This will be hard because we both have an entire collection of Terry Pratchetts each, and I think we’re both very reluctant to downsize because they mean so much to each of us and what if we both wanted to read them at the same time????). I can’t decide whether duplicates in a foreign language count, since they clearly serve a purpose beyond the story content of the original (I have a few duplicates in French and English because I find it a great way to help immersively learn a language). One idea I particularly liked was “if I keep it, is it worth the two (or more) books that I must get rid of when I put this one on the shelf?” (https://unclutterer.com/2007/06/25/read-a-book-and-pass-it-on/). It inspired me to take this further and order my books in a sort of preference. Kind of like book trumps. Which books would I never get rid of another book to keep? Which books would I get rid of any other book to keep? I think this could become a game. Once I’ve boxed all the books up, I am going to do this when I put them back on the shelves – starting with ten of the ones I know are least important, and every time I add a book to the shelf, taking another one off (if there comes a point where I can’t take any more books off the shelf, that’s ten books worth keeping, so I will start again with another set of ten books and do the same). To avoid sample bias, I will need to re-check the shelf afterwards. That was hard. There was a huge and ginormous problem with my method outlined above – it assumed I had some boxes to put books in. I didn’t. All our packing boxes left over from when we moved house? They’re all full of books from various times when we’ve had to move a set of books to do something or get at something else. All I could find was a shoebox and a box of crisps (now empty). I filled the shoebox with cast offs, until it got full, then I filled the crisp box, until it got full, then I filled the shoebox with the 10 books I would keep if the house was on fire or I was a refugee or something. The books I’d put in a campervan if I took one to places. Jo’s Boys (Louisa May Alcott) – 1886 edition. Worth about £5. Plenty of copies about. Passed down in my family for generations, just inherited from my mother, so not getting rid of it that easily! School Friend Annual 1955 and Pets Annual 1959 – Worth £5 and 0.66p respectively. Still keeping because they were my grandmas (on my dads side) and again I inherited. I think the School Friends and Jo’s Boys are my sentimental books. There were other books in both my mother’s and grandmother’s houses that I got, but these are the ones I would have great difficulty getting rid of. The School Friend annuals really sum up the culture and world my grandma lived in and grew up in, and Jo’s Boys is very reminiscent as a glossing-over of my own childhood, which could generously be described as “Old Fashioned” (and un-generously as Draconian). Artemis Fowl – the Opal Deception. Worth £2. Artemis Fowl and the Lost Colony. Worth £2. Artemis Fowl – the Arctic Incident. Worth £2. Artemis Fowl and The Time Paradox. Worth £3. Terry Pratchetts – worth £2 (very fine condition hardcover series books) to £8 (Hogfather Screenplay) to £10 (The Last Hero Hardcover) to £25-35 (The Art Of Discworld) to £35 (A Blink Of the Screen). Anthony Horowitz: Necropolis. Worth 0.66p. Anthony Horowitz: Snakehead. Worth £4.26. Diana Wynne Jones: The Game. Worth about £10. Diana Wynne Jones: Reflections. Worth about £10. JK Rowling: Harry Potter and the Half Blood Prince. Worth £5 (children) to £6 (adult), I have one copy of each. JK Rowling: Harry Potter and the Order of the Phoenix. Worth £1. LOLOLOLOL. Seriously £1. JK Rowling: Harry Potter and the Deathly Hallows. Worth £5 (children or adult). I have one copy of the children’s edition. Agatha Christie: Around £2.50 each. As paperbacks that take up 1/3 of the space of the hardback first edition books, I am more willing to keep these on the shelves. Also I inherited them off my recently-deceased mum who inherited them from my grandma. That shizzle needs time to settle. I valued my Famous Five red hardbacks at about 66p each. That is fine though – I am keeping my Enid Blytons for sentimental value. I should probably ditch the Artemis Fowl novels and the Harry Potter, since the Order Of The Phoenix was my second least favourite book and film and I think the Artemis Fowls have sadly had their day, been and gone. I guess they got over printed. The only Artemis Fowl worth over £3 is the only one I don’t have, because I couldn’t obtain a copy at the time and decided it would probably never be worth anything. Oh the irony. I guess this is the false economy of buying books – I always think getting the hardback first edition is better but I guess it really isn’t because they don’t hold their value as well as you would expect. HOWEVER, the value of the book cannot be judged by price alone, as I have demonstrated with the number of books I am keeping for sentimental reasons. Having said that, the prices are what they’re being sold at and I always think with anything under £3 that you have to work out how rapidly they’re actually selling at that price point, because that could just be what people hope to get for them, and there’s not a lot of price-slash wriggle room to get them shifted and it’s no indication about whether they would sell if I listed them on Amazon for that amount, taking up space in my house while I waited for them to be bought. That’s my first round of book culling pretty much finished, just a few stragglers to round up from other parts of the house because they don’t fit in my bookcase. I will, of course, have more to do but not right now because I found it very difficult to get rid of a lot of books that I probably don’t need. Also I was very hindered by the rabbits, in whose room my books live, as the books must stay out of their reach otherwise the bunnies will nibble the books, which would be sad. I was comforted by the number of minimalists and de-clutterers who had encountered the same emotional difficulty when parting with their books. I know I can read them online, I know I can go to the library, but it’s not the same as seeing them on the shelf. Before I try and cull them again I think I need to change strategy. Perhaps putting my “safe” books in a separate room, then sorting the remainder in order of… something. I don’t know. Some of them are useful but not essential. Some of them could be useful in the future. Some of them were 10p and the text might not be available at the same price again. My OH’s books, by contrast, include a great deal of impersonal and generic sci-fi and fantasy (I love love LOVE sci fi and fantasy when it’s good – but you wouldn’t actually believe how much dross there is. Time Snake and Superclown? There’s a reason you haven’t heard of it), and I’ve got a plan to get rid of some of these – I’m going to read them. Yep. I’m going to open each book and try to read it. If it’s boring, unreadable, overly-pretentious or full of “Said He”-isms, it’s getting queued for removal from the house. No second chances. My OH has given me permission to do this as long as he gets veto power over the books I’ve discarded before they get chucked. I think of it as a secretarial service – I’m filtering the junk mail so the Boss can spend more time on the important letters. I don’t think any of those are worth anything because they’re all a bit crap – he was given about 700 books about 15 years ago by a “friend” who was moving away and needed to get rid of his books.